Brigs - Award Winnings Breakfasts, Hot Sandwiches & Burgers, And Cool Salads! Enjoy Our Full Menu Any Time of Day! We toast a thick, hearty slice of locally baked whole grain bread with mashed avocados, seasoning and some great toppings. 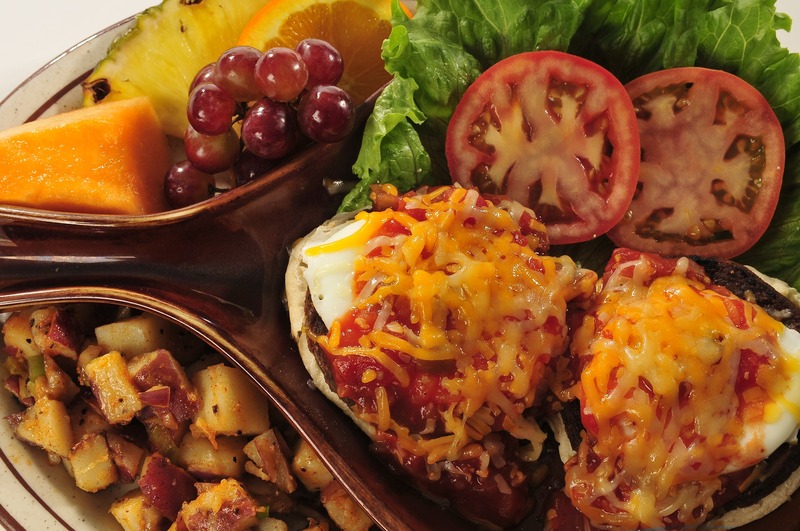 Served with two eggs* any style and your choice of homefries or grits or fresh fruit. With lemon-olive oil and fresh cilantro. With jalapenos, bacon and salsa. Served with two eggs* any style, your choice of homefries or grits or fresh fruit, and your choice from five different toasts and English muffins. Premium ingredients on a toasted English muffin, topped with two poached fresh eggs* and Hollandaise sauce, and served with fresh fruit and your choice of homefries or grits. Always an egg-cellent choice! Each month something new and exciting! Shaved smoked ham – a Brigs classic! Zesty pimento cheese and applewood smoked bacon. Smoked ham and smoked turkey topped with chopped bacon. Homemade crab cakes with a horseradish-parsley Hollandaise sauce. Blue crab and steamed shrimp. Creamed spinach and feta cheese. Smoked turkey, avocado and sauteed mushrooms. A bed of homefries, premium meats and fresh vegetables resting under a blanket of melted cheese, fire-baked and then crowned with a pair of basted eggs. * Served with your choice from five different toasts and English muffins. Smoked ham, bacon, mushrooms, caramelized onions and cheddar-jack. Broccoli, mushrooms, bell peppers, tomatoes, caramelized onions and cheddar-jack. Hickory smoked beef brisket, bacon, caramelized onions and provolone. Smoked ham, smoked turkey, bacon, tomatoes, caramelized onions and cheddar-jack. Roasted chicken, broccoli, mushrooms and cheddar-jack. Corned beef hash (instead of homefries), green chilies, caramelized onions, jalapenos, salsa and cheddar-jack. Three egg* omelettes bursting with your favorite ingredients. Served with your choice from five different toasts and English muffins, and homefries or grits or fresh fruit. All of our omelettes and scrambles are made with real eggs - no milk or batters added! Egg whites available for $1 extra. From old favorites to new and eggciting creations! Each Brigs location creates its own Omelette of the Week so that you have a plethora of omelettes throughout the year. Bacon, avocado, fresh spinach and cheddar-jack. Bacon, mushrooms, fresh spinach and Swiss. Smoked turkey, bacon, avocado, tomato, provolone, sour cream and chives. For the meat lover: ham, smoked turkey, bacon, pork sausage and cheddar-jack. Fresh broccoli, caramelized onions, mushrooms, tomatoes, bell peppers and cheddar-jack. Creamed spinach, tomatoes, calamata olives, and feta cheese, topped with Hollandaise sauce. Ham, caramelized onions, bell peppers and cheddar-jack. Fresh spinach, brie, mushrooms and tomatoes. Sausage, ham, bacon, mushrooms, bell peppers, caramelized onions, tomatoes and cheddar-jack. Fresh spinach, avocado, mushrooms, tomatoes and cheddar-jack. Hickory smoked beef brisket, caramelized onions, bell peppers and provolone. Diced chicken, spinach, roasted red peppers, artichoke hearts, feta and provolone. Blue crab, shrimp, and cream cheese, topped with Hollandaise sauce. 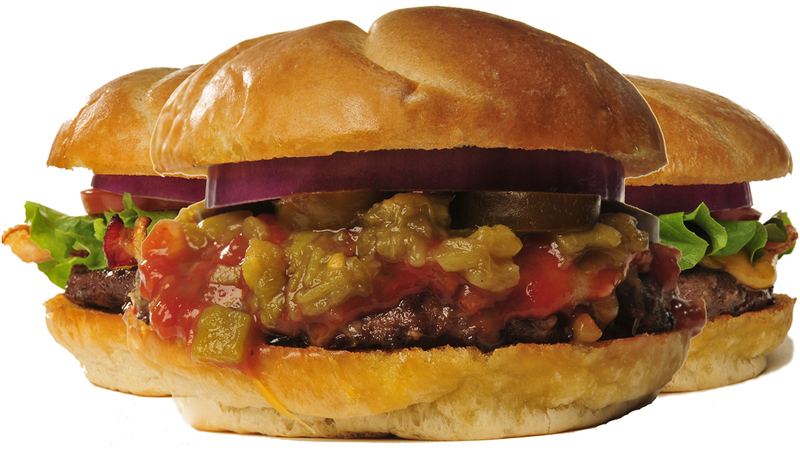 Green chilies, caramelized onions, jalapenos, cheddar-jack and salsa, topped with sour cream and chives. Oven-roasted chicken, mushrooms, broccoli and cream cheese, topped with Hollandaise sauce and toasted almonds. Cheddar, Swiss and Monterey Jack cheeses. Served with homefries, grits or fresh fruit and your choice from five different toasts and English muffins. Three large eggs scrambled with bacon, jalapenos, sour cream and fresh cilantro, then topped with cheddar-jack and fire-baked and served with salsa. Eggs scrambled with Swiss cheese, bacon, caramelized onions and a touch of sour cream. We scramble bacon, mushrooms, chives and eggs, top it with cheddar-jack, tomatoes and bacon, then fire-bake it. Eggs scrambled with zesty pimento cheese, smoked turkey, bacon and assorted bell peppers, and served with our homemade BBQ sauce on the side. Eggs scrambled with ham, bacon, chives and cream cheese, and served with Hollandaise on the side. Eggs scrambled with blue crab, shrimp, dill and cream cheese, and served with Hollandaise on the side. All griddle items are served with your choice of honey, sugar-free syrup, or our own special syrup made with real New England maple syrup. Our homemade batters are mixed fresh daily and available as a stack of three, a short stack of two, or try just one cake. Made with hand-sliced French bread, pure vanilla and cinnamon. Topped with powdered sugar and whipped butter. You may substitute homefries, grits or fresh fruit for eggs. Two large slices of French Toast filled with strawberries and sweetened whipped cream. Topped with powdered sugar. Some longtime southern breakfast and brunch favorites are now available at Brigs! Creamy grits with a blend of cheeses and sautéed shrimp, bacon, bell peppers and caramelized onions. Served with grilled pita points. Crispy chicken tenders and whipped butter atop our Traditional Belgian Waffle and served with two eggs* any style. Better than any Blue Plate Special! Served with your choice of homemade coleslaw or Brigs’ Broccoli Salad, grilled pita points, and your choice of homefries, classic-cut French fries or sweet potato French fries. Add your choice of Soup du Jour, House Salad or House Spinach Salad for just $1.99 extra. Marinated and grilled over open flame. Select one or two 6-ounce chicken breasts. Poached and served with mango salsa. Select one or two 4-ounce fillets. Served with your choice of lemon-dill aioli or our homemade cocktail sauce. Select one or two 5-ounce fillets. Zesty homemade crab cake served with your choice of lemon-dill aioli, horseradish-parsley Hollandaise or our homemade cocktail sauce. Select one or two 4-ounce cakes. Served with grilled pita points. Dressing selection includes Bleu Cheese, Sriracha Honey Mustard, Italian, Thousand Island, Ranch, Hot Poppy Seed, Raspberry Vinaigrette, Olive Oil and Balsamic Vinegar. Our grilled chicken breast atop mixed greens, bleu cheese, berries and pecans and served with raspberry vinaigrette or your choice of other dressing. Smoked turkey, ham, diced tomatoes, cucumbers, red onions, mushrooms, hard cooked egg and cheddar-jack atop mixed greens. Mixed greens topped with bacon, avocado, tomato, hard-cooked egg, bleu cheese and your choice of sliced smoked turkey, sliced smoked ham or our grilled chicken breast. Pitted Kalamata olives, feta cheese, red onions, diced tomatoes, artichoke hearts and bell peppers atop mixed greens, then seasoned with herbs and special dressing. Our grilled chicken breast atop a medley of greens, bell peppers, tomatoes, red onions, mushroom and cucumbers. Fresh spinach, chopped bacon, mushrooms, red onions, pecans, hard cooked egg and fresh strawberries. Served with our Hot Poppy Seed dressing. ++ A poached 4 ounce salmon fillet may be substituted for the grilled chicken breast on these salads for just $2. Our popular Broccoli Salad of broccoli, celery, golden raisins, red onions and sunflower seeds in our special sauce, surrounded by fresh fruit and grilled pita points. A marvelous mix of apples, raisins, celery, pecans and diced chicken breast with a touch of honey and mayonnaise is served with fresh fruit and warm banana-nut muffin (instead of pita). 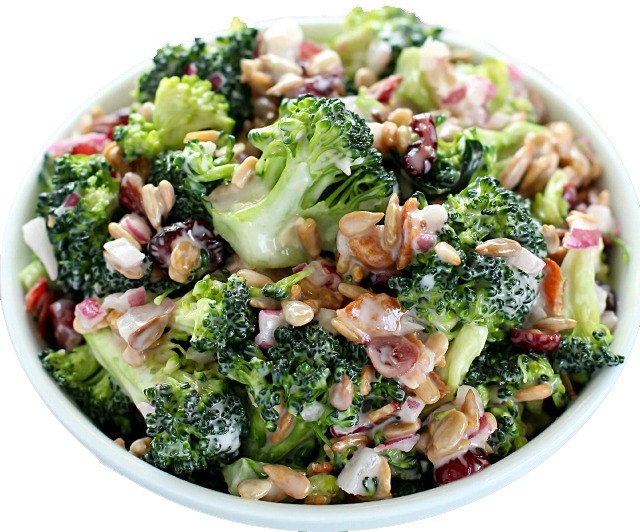 A scoop each of Brigs’ two great salads – Brigs’ Broccoli Salad and Brigs’ Waldorf-Chicken Salad is served with fresh fruit and warm banana-nut muffin (instead of pita). A piping hot bowl of Soup du Jour served with your choice of Brigs’ Broccoli Salad, House Salad or House Spinach Salad. We offer our homemade Brigs’ Broccoli Salad and Waldorf-Chicken Salad by the pint for take-out. For large quantities please call in advance. All of our sandwiches and 100% Angus burgers are served with your choice of homefries, classic-cut French fries, macaroni & cheese, fresh fruit, Brigs’ Broccoli Salad, House Salad, Spinach Salad or Soup du Jour. Each month something different – sometimes an old favorite, sometimes a seasonal special and sometimes something totally different! A knife and fork version with mounds of bacon, lettuce, tomatoes and melted cheddar-jack atop a grilled roll with mayo. Smoked turkey, shaved ham, crisp bacon strips, melted provolone, leaf lettuce and tomato in a warm, flaky croissant. Our quarter pound homemade crab cake with lemon-dill aioli, mixed greens and sliced tomato in a grilled soft Kaiser. A marinated chicken breast, grilled and served with mayo, leaf lettuce, tomato, bacon and melted provolone in a grilled soft Kaiser. With lemon-dill aioli, leaf lettuce, tomato and red onion in a grilled soft Kaiser. Smoked ham, melted Swiss cheese and raspberry jam in our Croissant French Toast, dusted with powdered sugar. Lean corned beef, sauerkraut, melted Swiss and thousand island dressing on thick, grilled rye. Our Smoked Turkey Reuben is also a great one! This southern cousin of the Reuben features lean corned beef, pimento cheese, leaf lettuce and tomato on grilled thick rye. A lot of folks like it better than its northern cousin! Grilled chicken breast with avocado, salsa, melted provolone, bacon, fresh cilantro, lettuce and tomato in a grilled soft Kaiser. Smoked turkey, roasted red peppers, artichoke hearts, feta, provolone, lettuce and tomato in grilled thick slices of rye. A grilled pita filled with smoked turkey, fresh broccoli, tomatoes, mushrooms, bell peppers and caramelized onions in melted Provolone cheese. A warm butter croissant with hickory smoked beef brisket, caramelized onions, roasted red peppers and melted provolone. A warm butter croissant with smoked turkey, cheddar-jack, leaf lettuce and tomato. Our famous Waldorf-Chicken Salad in a warm, flaky croissant with crisp leaf lettuce. Smoked turkey, avocado, bacon, lettuce, tomato and a touch of mayo on thick, grilled slices of rye. 100% Certified Angus Beef® cooked over an open fire to your specification and served in a grilled soft Kaiser. Angus Cheeseburger – No Bacon! Our flame broiled 100% Certified Angus Beef® burger* with applewood smoked bacon, leaf lettuce, tomato, red onion and your choice of melted cheddar-jack, Swiss, bleu or brie. A 5 ounce flame broiled 100% Certified Angus Beef® burger* Angus burger, smoked beef brisket, bacon strips and our homemade BBQ sauce. Our flame broiled 100% Certified Angus Beef® burger* with zesty pimento cheese, mixed greens, tomato and red onion. An American favorite: Our 100% Certified Angus Beef® burger* with caramelized onions and Swiss cheese between grilled thick slices of rye. No Kaiser for this classic! Consuming raw or undercooked eggs or meats may increase your risk of foodborne illness.